Congratulations to the winners of the last contest. Leighton Gage's Dying Gasp will go to Lex R. from Belleville, NJ. Marina M. from Eugene, OR won the ARC of Frederick Ramsay's Predators. The books will go out in the mail tomorrow. Poisoned Pen Press is one of my favorite mystery publishers. I reviewed two books they published this week, so it's the ideal time to give away a couple of their ARCs. 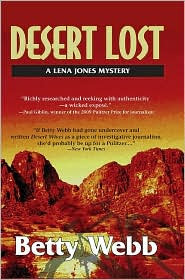 When Betty Webb appeared at the Velma Teague Library on Monday, she signed an ARC of her latest Lena Jones mystery, Desert Lost. This is the perfect introduction to Lena, and her Scottsdale, Arizona business. As Betty said, she gives you enough information about Lena in each book that you don't have to start at the beginning of the series. So, if you've been curious about this series, or, if you just want to read the new book, now's your chance to enter to win a copy. I just reviewed Jeffrey M. Siger's Assassins of Athens. Now, meet Andreas Kaldis in the debut mystery in the series, Murder in Mykonos. I have an ARC of the book that found him exiled to Mykonos, a beautiful spot, but an island that harbors a serial killer. Now, Andreas, exiled for being politically incorrect, must deal with a local government that doesn't want to drive away tourists. A serial killer can't exist on their beautiful island. Two more gems from Poisoned Pen Press. 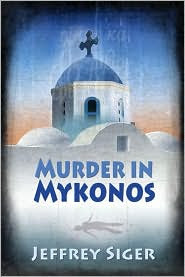 Do you want to win Desert Lost or Murder in Mykonos? You can enter to win both, but I need separate entries for each. If you'd like to win one, email me at Email me!. If that link doesn't work for you, the email address is: lholstine@yahoo.com. Your subject line should read either, Win "Desert Lost" or Win "Mykonos." Your message should include your mailing address. Entrants only in the U.S., please. The contest will end Thursday, Feb. 4 at 6 p.m. MT. Jim will draw the winners at that time. The winners will be notified, and the books will go out in the mail on Friday. Good luck! Such a nice post, it is really interesting, want to admire you, you are really a hard worker, Thanks. i really admire your post. Robert B. Parker - R.I.P.